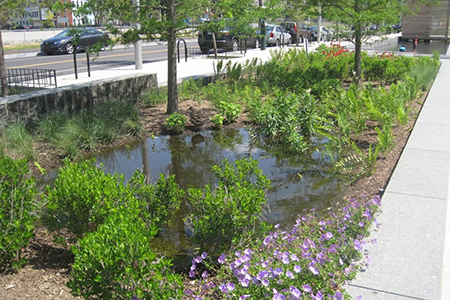 Rain gardens are a grouping of native shrubs, perennials, and flowers planted in a small depression, which is generally formed on a natural slope. They are designed to temporarily hold and soak in rain water runoff that flows from roofs, driveways, patios or lawns. 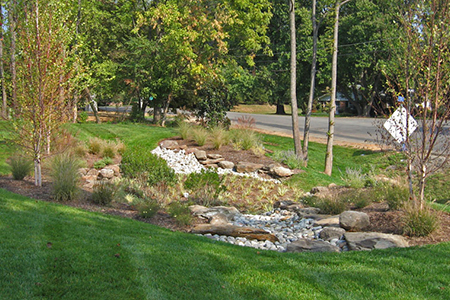 Through the JOCO Cost Share program, you could receive up to a 50% reimbursement for installing a rain garden on your property. Please reference your city's reimbursement program for more information and to apply. 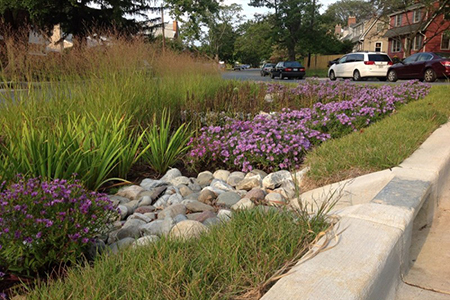 The most logical location for your rain garden is in an existing low spot in your yard. Place your garden where downspouts will drain into it, directing water with a shallow swale if necessary. 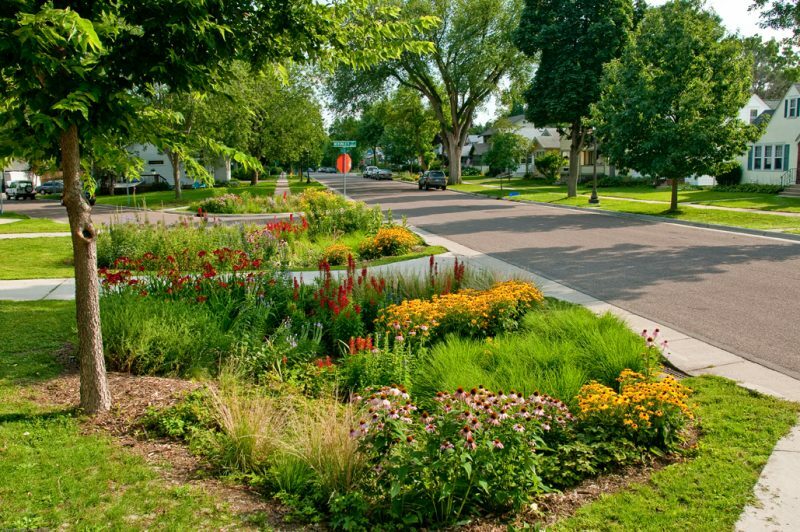 Place your rain garden at least 10 feet from a home or building to keep water from seeping into and damaging the foundation. Start by digging a 4-8” depression with gradually sloping sides as large in circumference as you like. (A good rule of thumb is to size your garden at 30 percent of the area of the roof from which it will be collecting water.) A 4-8” depth will allow water to be captured, but will dry between rain events. If you prefer to hold water in your garden in drier times, dig a portion a little deeper, say 18” in depth. Test your soil’s ability to hold water by filling the hole with water. 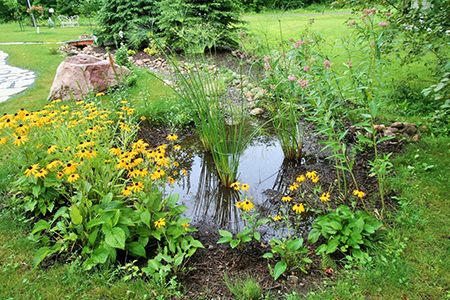 If it drains out, you may want to install a plastic liner and place the plants around the liner. Plant natives recommended for our area. Add untreated, shredded hardwood mulch to a depth of 3” on all of the bare soil around the plants to prevent erosion while your natives are establishing. While your natives are establishing their roots, you’ll need to water them about every other day. This should be done for the first two to three weeks, or until the plants show that they are growing and doing well. When natives are established, they require little or no additional watering! Remember not to fertilize natives. Fertilizer causes them to grow too tall and fall over. It also stimulates weed growth, creating competition for your natives. Use native plants! 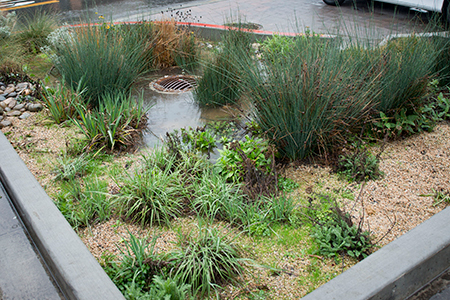 Natives are a natural for this because they tolerate short periods of standing water, are drought-tolerant, and their deep roots make it easy for water to move down into the soil. These plants do best in areas where they will receive between four and six hours of sun per day. Morning sun and afternoon shade is best. These plants do best when they can receive six or more hours of sun per day.